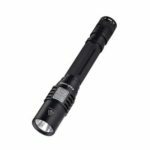 This NITECORE EC21 LED Flashlight is capable of producing far-throwing focused beam,with superiorly well-rounded and balanced performer, built-for the avid outdoorsmen in mind. 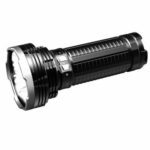 Utilizes CREE XP-G2 (R5) LED. 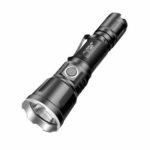 Maximum output of 460 lumens. Dual-switch design ensures unprecedented ease of use. Secondary red LED provides constant / flashing illumination . 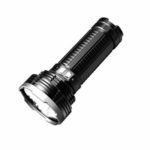 Integrated Precision Digital Optics Technology provides extreme reflector performance. 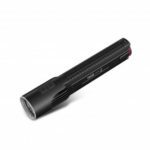 Indicates battery voltage with a red flashing LED. 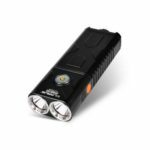 Three concealed special modes for outdoor emergencies, Strobe, SOS, Location Beacon. High efficiency constant current circuit enables maximum runtime of up to 430 hours. Direct access to ultra-low and turbo output.